You are here: Home / Blog / Mobile Cataract Services / What is Your Vision? 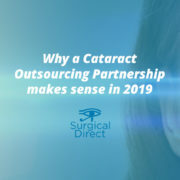 Partnering with Surgical Direct Inc provides your OR with the industry’s best cataract outsourcing service available, and behind the scenes, our Practice Growth Team works on your behalf to learn what your vision is for your practice, and we help you with a map to get there successfully. We replace the obstacles with a growth-centric infrastructure that rally’s OD referrals, along with installing and establishing a streamlined cataract program at a satellite facility in the territories you are wanting to expand in. Together we create a customized solution as to how to achieve the growth vision you have in mind, and with providing you and facilities with reliable cataract technology and our streamlined service is a process that has proven growth and expansion! As a surgeon, when you connect with Surgical Direct, you are given access to our extensive OD referral network. This is especially valuable if you have the desire to begin Satellite Cataract surgery within drivable areas that are outside your normal area of practice. Our extensive OD referral network opens up satellite location possibilities. If you are interested in expanding your surgical practice into new territories, we have the connections you need for your vision to become reality. 1) We do the legwork in connecting you to OD referrals. Let us know where you would like to begin operating, and we will get you connected to referring OD’s in the surrounding area of interest. If we don’t already have connections in that area, we will find them for you. This has the potential to turn minimal monthly referrals into a larger number, making a potential surgery day in that area more substantial and profitable for your practice and the local facility that we help to place you in. This model of surgical care is very successful in rural areas because it reduces patient commutes outside their region. This makes for happy patients and referring physicians! 2) We handle all logistics and coordination with the local Hospital / ASC. Generally, rural area hospitals will not have designated capital to invest in Ophthalmic equipment if the surgeon only has enough cases for a once-per-month surgery day. This is where we come in and shine! We will do all the legwork with the hospital to ensure that you (the surgeon) have everything that you need, no matter the location. Providing your desired equipment with your tailored settings, your customized supply list, organizing and coordinating instruments, and a consistent surgical coordinator makes stepping into a new facility for the first time as if it were in your own surgery center. Our goal is to make it as easy as possible for you to step into a new facility! 3) Repeatable systems that work in multiple Satellite locations. The benefit of this system is that we can reproduce the exact same process in as many satellite locations that you would like, ensuring consistent surgical outcomes. Once we’ve worked with you in one location, we know your process, procedure needs, likes, and dislikes making adding another satellite location an easier step. This gives you the opportunity to grow your practice and revenue without dealing with all the minute details involved in getting started in a new facility. Our goal is to act as your partner. Your success is our success, and your vision is our vision! Whether you already work with us or have never heard of us before, we have finely-tuned logistical systems in place that make getting Cataracts started in a new facility easy! For more details about our service offerings, visit our Mobile Cataract Services page and give us a call to begin discussions about your needs and goals. We also offer a FREE Demo Day, so you can put your inhibitions aside about whether or not we are the real deal. Surgical Direct Inc is a partner that you can trust and depend on! What All does SDI Offer? Surgical Direct, Inc. partners with hospitals and surgery centers providing the highest quality ophthalmic equipment, supplies, and technical assistance on an as-needed basis.